Over the past 40 years, Ace Centerpoint has been one of the go-to place for shopping for the people of South Cotabato. And to thank their valued customers for continued support, Ace Centerpoint has launched the TrACEcycle Trip, Grocery Treat The 40th Anniversary Raffle Promo, with a grand prize of a Tricycle unit for three (3) of it's lucky shoppers. There will be also ten (10) winners of Grocery supply worth P2,000 for six (6) months and forty (40) lucky shoppers will win P2,000 worth of Gift Certificate. Joining is easy, simply shop at Ace Centerpoint and exchange your receipt for a raffle coupon. 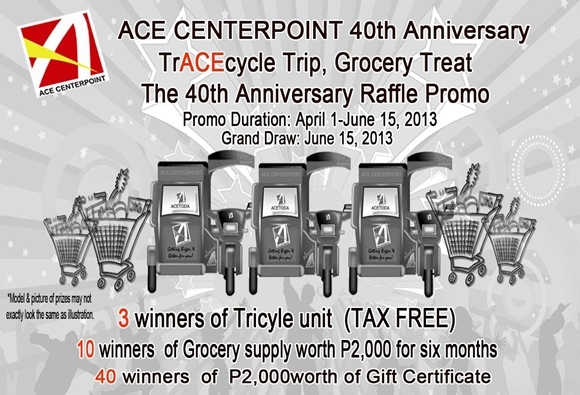 TrACEcycle Trip, Grocery Treat The 40th Anniversary Raffle Promo runs from April 1- June 15, 2013. Check out posters and fliers for more details. Shop now at Ace Centerpoint for chances of winning!